At ZAO “Alkoa SMZ” they studied the effectiveness of alloying and inoculatingadditives supplied by various producers, as well as the influence of those additives’ quality on the properties of wrought blanks produced. Key words: Wrought aluminum alloys, alloying, inoculation, return of own production, ingot structure. Based on analysis of existing theories and results, research centrifuge pre and hypereutectic cast iron melting is a diagram of the formation of graphite during cast iron crystallization. The possibility of globular graphite formation without the use of modifiers and technology for producing composite castings for sliding bearings by centrifugal casting is shown. Keywords: Cast iron, graphite, cementite, ?-carbide, pre and hypereutectic cast irons, centrifugation,crystallization, the critical nucleus, the melt eutectic, diffusion. The author tells us about the possibility of applying for the manufacture of knives, unconventional materials. A comparative analysis of steels 40Х10С2М (ЭИ107), 100Х13М (ЭИ515), 95-110Х18М-ШД and describing their advantages and disadvantages. Keywords: Cold steel, thermal treatment, unconventional materials. The methodology for wagon brakeblock frictional metal-sintered material development is presented. The results of developed frictional materials friction tests with aim to determine their wear resistance and friction coefficient are shown. The difference in developed materials properties are explained on the base of microstructure analysis. The developed materials and used at present brakeblocks materials – cast iron and polymer composite TIIR-300 – are compared from inherent wear resistance, brakeage efficiency and counterbody affecting point of view. Key words: Metal-ceramic braking shoe, pearlite, ferrite, carbides, frictional material, friction coefficient, wear. Old class of light-weight casting alloys of the system Al–Mg–Si–Mn recently has been returned to the foundry practice for producing of car parts. In as-cast state alloys with nominal composition AlMg7Si3Mn and AlMg5Si2Mn contains three phases: ?-Al solid solution, (Al)+(Mg2Si) eutectic and Mg2Si primary crystals. By metallographic examinations it was established that during solution treatment (Al)+(Mg2Si) eutectic tends to spheroidisation. Using shape instability model it has been calculated that complete spheroidisation take place after 60 minutes soaking. Modeled results were confirmed experimentally. Keywords: Cast Al–Mg–Si aluminium alloys, DSC, eutectic morphology, modeling. In work the review of modern laser and plasmatechnologies is submitted and prospectsof their application and development, including in the field of modifying of a surface and synthesis of new alloys and connections are shown. Keywords: Laser and plasma technologies, welding and cladding, it is sharp, microstructuring, a ligature, wear resistance. The problem of regularity by a crystal structure of sheet strips from the high-alloyed aluminum alloys of Al–Fe–Si–Mn system in the roll crystallizer closely relative with problems of improvement of quality of a foil and increase in productivity of twin roll casting process is discussed. The structure of foil strip can be presented as the form of information system. Influence of various ways of influence on the melt of a being able solid and liquid phases is considered. Keywords: Aluminum alloy, the structure, twin roll casting, a dendrite structure, foil. Discussed are the results of implementing at OAO “Kamensk-Uralsk Nonferrous MetalsMachining Plant” a program of organizing commercial production of newly adopted article types of high quality level from the following bronzes: tin-phosphor bronze, chromium bronze, and chromium-zirconium bronze, tinless hard-to-deform bronzes. 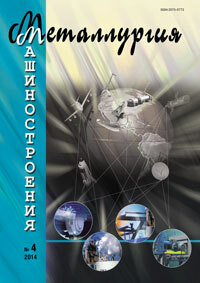 The products are successfully used by Russian and foreign machine-building plants. Key words: Bronzes, wide grade and size range, difference of process flowsheets, commercial production, compliance with normative document requirements. The tests methods of copper alloys specimens in temperature diapason for formation of billetcrystallization of machine for continuous casting at (0,9…0,95)TL are worked out. The given temperature diapason is being characterized with increasing deformation speed in 2000 times as much in comparisonspeed in temperature diapason (0,3…0,5)TL, in which the deformation of constructional materials in exploitation continuous. Key words: Copper alloys, billet, deformation, temperature diapason, formation of billet, testing machines, heating speed of billet. The article presents the results of examining the microstructure of metals produced by casting and punching in equal-channel stepped dies (ECSD). Analysis of the examination results showed that on the inclined area of the ECSD there emerge shear bands that extend virtually in parallel to the die’s channel connection areas and beneficially influence the closure and welding of all internal casting defects. The shear bands emerge owing to realization of intensive shear deformations on the ECSD’s inclined area II – II. Key words: Microstructure of metals, scanning electron microscope, transmission electron microscope, shear bands, joint areas, closure and welding of defects, ECSD’s inclined area.